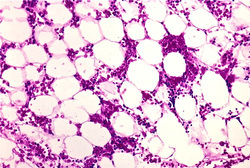 Aplastic anemia may present with pancytopenia as well as hypocellularity of the bone marrow. There will be a fatty changes and absent of any hematopoietic cells. Aplastic anemia commonly occur as a result of hepatitis C virus infection, parvovirus B19 infection, alkylating agents, chloramphenicol, benzene and radiation as well as autoimmune dysfunction of the cytotoxic T cells. Aplastic anemia is treated by avoiding any drugs ( alkylating agent, chloramphenicol) that may precipitate it, blood transfusion therapy, transplant of the bone marrow and administration of the G- CSF. The common signs and symptoms of aplastic anemia may include petechiae, purpura and mucosal bleeding due to thrombocytopenia ( reduction in platelet count), increase susceptibility to infection ( neutropenia due to reduction of the neutrophil count) and pallor ( reduction in the Hb level which lead to anemia. 1.Young, Neal S. “Acquired Aplastic Anemia.” Annals of Internal Medicine 136, no. 7 (April 2, 2002): 534–546. doi:10.7326/0003-4819-136-7-200204020-00011. 2.Young, Neal S., Rodrigo T. Calado, and Phillip Scheinberg. “Current Concepts in the Pathophysiology and Treatment of Aplastic Anemia.” Blood 108, no. 8 (October 15, 2006): 2509–2519. doi:10.1182/blood-2006-03-010777.